Valentines Day is right around the corner! I love making resources that capitalize on the excitement of the season. Something as simple as having themed worksheets for your math lessons can make your child(ren) more engaged and excited about their math time. 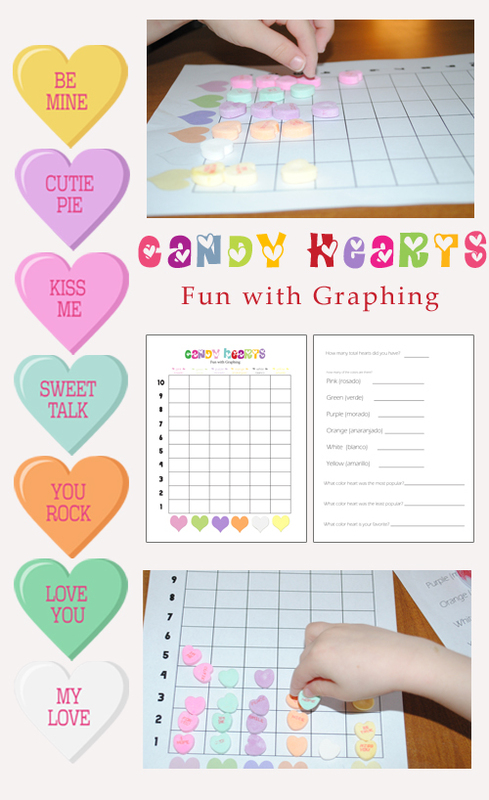 So, to make the most of the excitement I created these Valentines Day Conversation Heart Math: Graphing worksheets. They are compete with an amazing analysis page that takes the resource to a whole new level! Sidenote: I have been itching to begin incorporating another language into our daily learning activities. I took to Facebook, to see what second language you would prefer your child to learn. The winner (and my personal vote) was Spanish. So I have incorporate some Spanish vocabulary (colors) in this printable packet. I took a handful of Conversation Hearts and put them in a small bucket. Once they have placed all of the hearts on the graph, sit down and begin to go over the analysis page with them. Sit down next to your child (or read to the class) the questions on the analysis page. If your little one is too small to write their answers, just use this page as a Q&A session with your little one! While you are here, make sure you check out my other Valentines Themed activities / printables! Enjoy these additional math worksheets with these Valentines Day Math Worksheets: Greater-Than, Less-Than Worksheets! Start a new favorite family tradition with these amazing Valentines Day–Advent Hearts! If you are loving the conversation heart worksheets, here is a whole variety of new ones! check them out: 7 Awesome Conversation Heart Activities! It is important to me that my boys are grateful, compassionate, and kind! To facilitate these traits we perform random acts of love on Valentines Day! Last year we created Valentines Day Gourmet Popcorn to pass out! Preschool Math- Greater Than, Less Than; St. Patrick Day! 7 Awesome Conversation Heart Activities!